The above info came from Khiwanean, and was edited by yours truly (contact me). Angel Sanctuary is about Setsuna's love for his sister Sara. Things are complicated, not only by the fact that he is in love with his own sister, but Setsuna is also the reincarnation of a powerful fallen angel, Alexiel. Setsuna is pursued by people from both heaven and hell who are attempting to awaken Alexiel within him. From hell, Kurai and Arkune, are trying to awaken her to continue the battle with heaven. Alexiel's twin brother, Rosiel, arrives from heaven with the sole purpose of destroying her. Setsuna just wants to be with Sara. 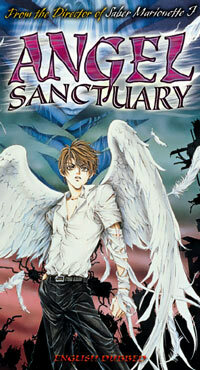 Angel Sanctuary is based off of a twenty volume manga. The anime only covers the first five books. It is somewhat confusing, what with reincarnations and gender confusion, but is an enthralling anime all the same. The above description came from Khiwanean, and was edited by yours truly (contact me).